How will I know if my order has been processed? After your purchase, you will receive a confirmation email that confirms the details of your purchase. You can expect an email from us after 3-5 business days with your tracking information. You can also email or call us at anytime. Just visit our Contact Us page. How long will it take to receive my shipment? Average delivery time is 3 to 10 business days. There are times when orders can take longer to arrive such as deliveries to rural areas. We take pride in being one of the fastest shippers in our business and most items are on their way in 2 to 3 days. Can I get a discount instead of getting free stuff with my shed? Sometimes our manufacturers promote their items by adding accessories free if you purchase a selected product on promotion. Our cost for these products remains the same whether you keep the free promotional items or not so we cannot discount you further if you do not want the free items. How do I know that this purchase is secured online? We utilize Secure Sockets Layer (SSL) encryption protocol. SSL protects customer information such as credit card numbers, names, and addresses during the exchange between your computer and our server. All credit card transactions are processed through our SSL secure server provided by Norton. You will know the information is protected if the closed-lock symbol pops into view in the lower right or left-hand corner of your screen while you are checking out. You can also verify secure pages by checking the address or URL listed on the location bar. If you spot an "s" after the "http" at the beginning of the address, you know that you are browsing in a secure environment. Do I have to pay for Sales Tax? Sales tax will not be charged to your account in most states excluding CA, IL, MI, MO, NJ, OK and WA. Your state may charge a use tax to buy online. 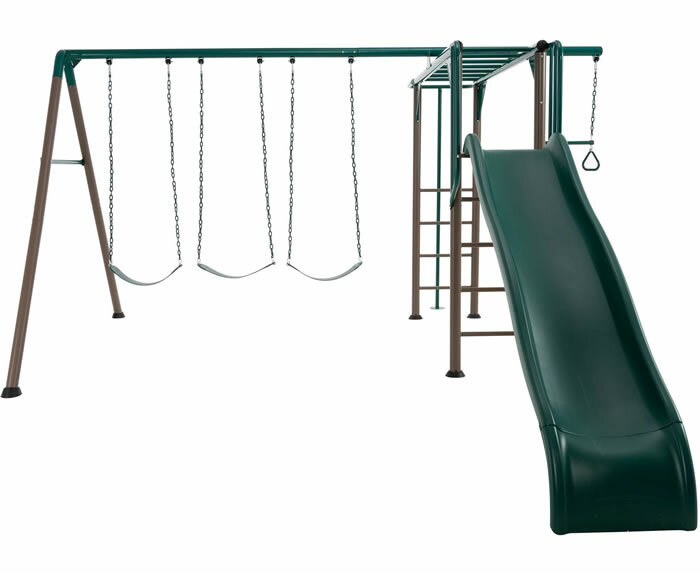 Do you assemble the sheds and playgrounds? No, these are do-it-yourself kits that will help you save money on your project. Our products arrive at your home ready to be assembled by you. The instructions are geared towards an average homeowner and assembly time will depend on your skill level. 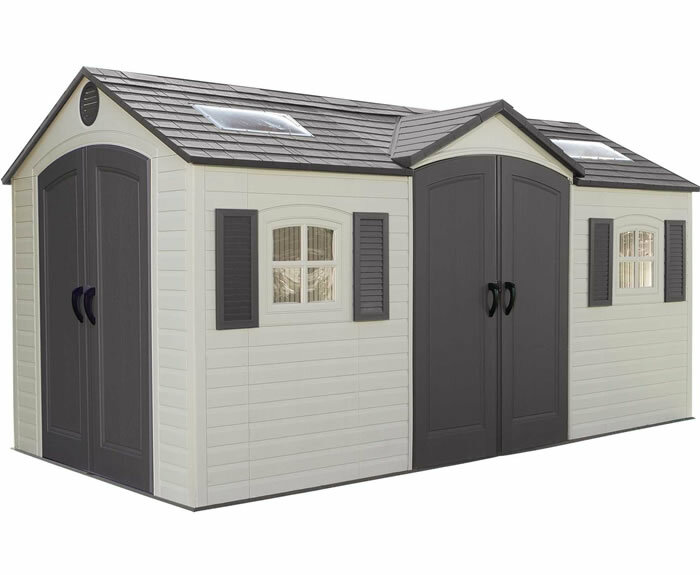 Can I paint my new shed? Some of our wood sheds require to be painted. 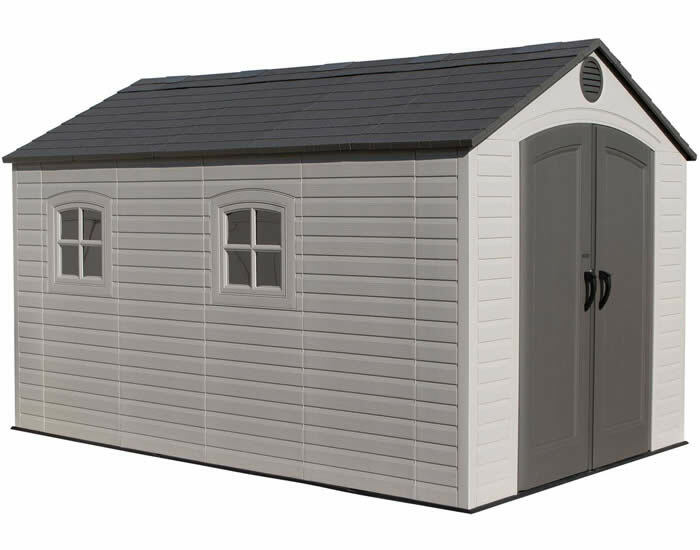 Although we do not recommend painting any of our other sheds, our Arrow brand metal sheds are paintable. You could also paint the DuraMax brand vinyl sheds if you use paint made specifically for PVC. However, paint will require future maintenance and may void some warranties. Can I tear down my shed and build it again? You can tear down the Arrow, DuraMax and Lifetime sheds and build again. You would need additional parts such as plugs, pins, and washers which can be obtained from the manufacturer by calling the number on your owners manual. Our Best Barns wood sheds cannot be taken down once they are erected. What Do I build the shed on? The most important thing to remember is that you need a level flat surface on which you can build the shed. A floor is not required for most of our sheds and is optional. The floor can be a level concrete pad, wood patio, gravel, concrete bricks or you can purchase one of our floor foundation kits. Do any of the sheds come with a complete floor included? Yes, all of our Lifetime sheds come with a floor and so do some of our DuraMax and Best Barns buildings. If it does not come with a floor you can add a floor kit to your order. Can I build the shed on an existing concrete pad? Yes, you can build the shed on an existing concrete pad as long as it is level. We recommend buying anchors to secure it to the concrete. Do you have a warranty? How Long? All of our sheds come with a manufacturers warranty. Arrow sheds have a 12 year warranty on metal sheds and a 15 year warranty on the vinyl coated sheds. DuraMax and Best Barns both cover all there buildings with a 15 year warranty. Lifetime sheds are backed by a 10 year warranty. All warranties are slightly different but the main thing they cover are defects, fading, corrosion and rusting. If any of these are found replacements are sent to the customer free of charge. How long does it take to assemble? Assembly times vary depending on the size and brand of the shed, whether you have a foundation and number of extensions kits. Most of our sheds could be put together by one person but we recommend two people to assemble most buildings. Some rough estimates would be: 10x8 takes two people 4-5 hours, the 5x3 takes 1 hour, the 4x8 takes 3-4 hours; and an 8x6 takes 2 people 3-4 hours. Your choice of foundation and the number of extensions you wish to add to the shed will add to your assembly time. Is it possible to enlarge your shed? 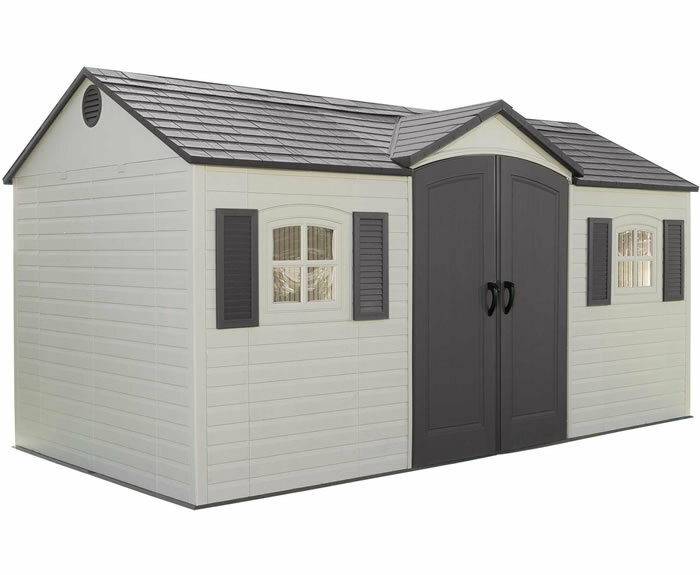 Our DuraMax and Lifetime brand storage sheds can be made larger by adding an extension kit. Arrow and Best Barns sheds come in standard sizes and cannot be extended. Will my new shed leak, is it water tight? 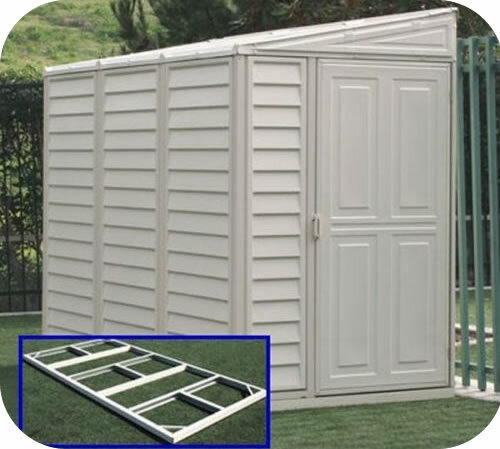 All of our sheds are made to keep your stored items dry. As long as your surface is level to avoid any seepage from the ground you should not have to worry about water getting inside from your roof. Are any of your sheds insulated? Can my animals live in them? With the exception of our DuraMax insulated building, none of our other sheds are insulated. Our storage sheds are made for storing things and we do not recommend you use them as animal houses. The reason you should not store animals in these is that in severe cold weather the inside of your shed will not stay warm unless you add your own insulation to it. What is the shipping process since its a large building? Some of our storage buildings and other products are very large and too heavy to ship via package carriers. Contracted freight companies deliver these structures. These companies will call the consumer when merchandise arrives at their terminal to set up a delivery time that is convenient for you. These companies provide tailgate delivery. Upon delivery the driver is only required to take products to your driveway or entrance of delivery address. The carrier is not responsible for bringing merchandise into your home, uncrating, installing or removing packing materials. Truck freight is different than standard UPS, FedEx or US Mail in that you will be responsible for carrying the product from the back of the truck into your house (or wherever its going). If you are ordering a very large item, please keep in mind that you may need a couple of people to help unload it. Alternatively, most truck freight companies offer additional services to help you move items from the truck into your house. Once we email you the tracking information you can contact the shipper directly to inquire about additional services. You would be responsible for directly paying the truck freight carrier for any additional services. Do you ship outside the continental United States? Due to the cost of shipping large products and the many problems that can be encountered with customs regulations, we do not ship outside the 48 contiguous United States. What tools will I need to assemble my shed? A number 2 Phillips head screwdriver, a pair of pliers, work gloves, and a stepladder. A magnetic tip cordless screwgun will speed up assembly time by 40 percent. Two people are also recommended. Do not assemble the building on a windy day. *Best Barns wood storage sheds require more tools. Are the instructions easy to follow? Yes, every shed kit, greenhouse, stove, playground set or any other products come with an easy to follow instruction manual for assembly. You should always read the instructions before you start. Your owners manual will have a toll free telephone number in it if you have any assembly questions. No experience is necessary; our instructions are written for the novice in plain English with three dimensional pictures that will guide you through each step.